Last weekend, my kids and I drove down to celebrate my parent’s 50th wedding anniversary. For me to hit that milestone, I’d need to get married in the next year or two and live to be 100. Stranger things have happened. My siblings and I threw our parents a luncheon Saturday and my dad sprung for a really nice party Saturday night. Friday night I went with my buddy Stephen, his wife and daughter and my two kids for the obligatory rib dinner at the Rendezvous. Afterwards, I fired up a cigar and cracked open a bottle of 1976 Dom Perignon champagne to start the celebration early. 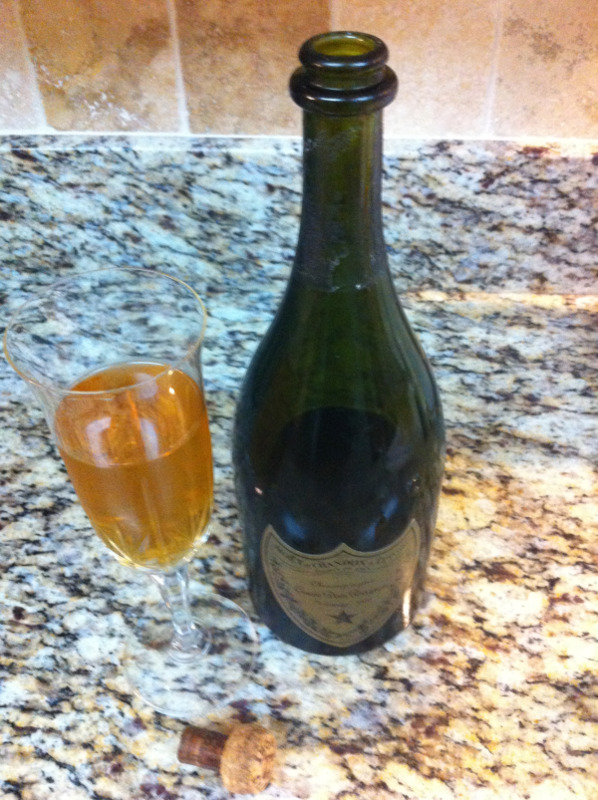 There is an interesting story about how 1976 Dom Perignon found its way into my family. In 1984, my buddy Stephen and I were backpacking through Europe. The French Franc, normally four to the U.S. dollar was trading for eight to one. In money math, we had double the buying power. On the way back home, we saw bottles of Dom Perignon for $23 a bottle. I figured an extra seventy bucks on my almost maxed out American Express wouldn’t matter. I brought home three bottles and advised my parents to pick up a bottle on their upcoming trip. I later found out the 1976 vintage was one of their better years. My first bottle was consumed with a college crush. Frankly, the bottle was a little young to be opened. I wish I had known. My date ended up hammered and threw up. We never went out again. The second bottle was opened to celebrate the end of an expensive lawsuit with our franchisor. My partner, our wives, and I went out to the nicest restaurant in Nashville at the time, and I brought bottle number two; valued at over six hundred dollars. If 24 karat gold were a drink, it would have been this champagne. Bottle number three was just a little past its prime, consumed four years ago proposing to wife number two. It should have been a sign. I told my father to open his, but he resisted. I guess he was waiting for a special occasion like his 50th. I could tell from the cork, my dad’s bottle was past its prime. One taste and we all definitely knew. What in your life are you waiting to do or experience? What are you holding on to? I’m not advocating irresponsibility, but every day you wait is another day that you’ll never get back. Obviously, since my main focus is marketing, my first piece of advice is to get busy marketing your restaurant and catering profit center. Sales momentum is great for the psyche of your staff and your sales. The more money you make, the more you can accomplish and attain in your personal life. Since we no longer live on an economy of sea shells, it’s the green backs that act as score keepers and guides to a better life. Even if it’s a long overdue date night with your spouse, stop procrastinating. Speaking of date night, I have decided to no longer put off a project. Four years ago I came up with a concept for a cooking show: Date Night Dinners: Whether you’ve been dating four months or married forty years, make time once a week to share a special meal with the one you love. The premise was to invite people to share their date night stories and recipes and cook together. The goal is to uncover real, touching and funny stories and great recipes from men, women, husbands, wives, grandparents, etc. I have not officially kicked off the blog, but my first recipe and You Tube video features a recipe for Caprese Napoleon. The other pictures are just placeholders.